The 2015 Genesis Coupe is the latest home run hit by Hyundai Motor Co. So much so that Henderson Hyundai Superstore salesman Joe Rodriguez purchased one. This rear-wheel drive, luxury sports car is powered by a high performance 3.8-liter direct-injected V-6 that produces 348 horsepower and 295 pound feet of torque. 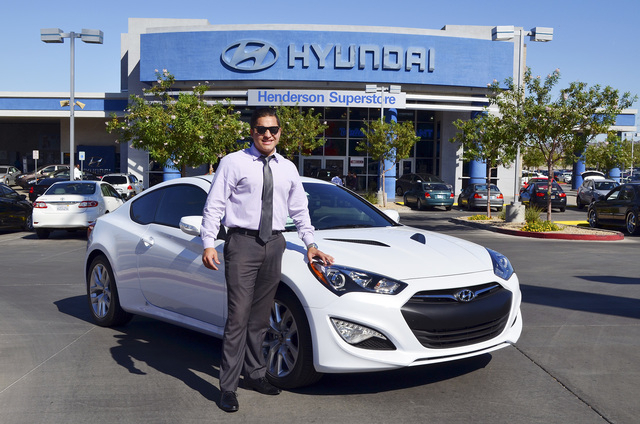 Rodriguez purchased his Genesis Coupe shortly after the first test drive and said that, just like anyone else, he also likes the idea of being able to take advantage of all the perks that come with purchasing a car from Henderson Hyundai Superstore. It offers customers free lifetime oil changes and car washes with each new-car purchase, free truck rentals two times per year and free lifetime powertrain protection with all preowned vehicles. Henderson Hyundai Superstore has been ranked as one of the country’s top-selling Hyundai dealers. The dealership has been family-owned and operated since 2007 and is at 460 N. Boulder Highway, between Lake Mead Boulevard and Warm Springs Road. It is open from 8 a.m. to 9 p.m. Monday through Saturday. The service department is open from 7 a.m. to 6 p.m. Monday through Friday and 7 a.m. to 4 p.m. Saturday. Henderson Hyundai Superstore carries Hyundai parts, accessories and certified auto repair and services. For more information, visit HendersonHyundai.com or call 702-799-9511.